« Get to know our Board of Directors! I am extremely proud to serve on the board for Hats Off For Cancer. My empathy with those who lose their hair through surgery or chemotherapy is very personal for me. In 1993, at the age of 33 and a mother of two beautiful children aged 9 months and 7 yrs, I was diagnosed with a Pleomorphic Adenoma. As a child I had suffered from severe headaches and as my Mother had suffered from Migraines, I was treated accordingly. It was not until I lost my hearing, in what seemed like a flash on an ordinary day, that the doctor’s investigated. An MRI showcased a tumor the size of an orange encompassing my parotid gland on the right hand side of my head. It was dangerously close to my facial nerve and was pressing on the parasympathetic nerve at the base of my skull, which the cause of my loss of hearing. To say I was petrified was an understatement for sure! The doctors told me they had never seen a pleomorphic adenoma as big as mine was. They surmised it had been growing for at least 25 years! No wonder those headaches I endured all those years were so painful! Though it is classified as a benign tumor, pleomorphic adenomas have the capacity to grow to large proportions and may undergo malignant transformation, to form carcinoma ex-pleomorphic adenoma, a risk that increases with time. Although my tumor was “benign” the tumor was aneuploid, which means it can recur after resection and it can invade normal adjacent tissue. Distant metastases have been reported after long (+10 years) time intervals. Surgery was performed immediately to remove the tumor and I woke up to find my head had been shaved on the right side. I was grateful to have long hair at the time and was able to conceal the shaved area with a big comb over! As my facial nerve had been stretched in order to get the tumor out, I experienced facial paralysis for 5 months. Thankfully this was short lived and I continue to have my MRI checkups and am extremely grateful to say they have all been clear. As a HOFC Board member, I am honored to partner with the “World’s Greatest Bank”, Umpqua Bank in Portland, Oregon. Umpqua Bank has committed to an ongoing relationship with Hats Off For Cancer using their locations at various retirement facilities in and around Oregon. The wonderful ladies in the knitting clubs at the retirement centers knit and crochet hats all year long. Umpqua Bank generously donates all the wool and baggies to package the hats in. Each year, on HOFC’s Mad Hatter Day, Umpqua Bank throws a big party at one of the retirement centers for the knitting club ladies and they do a hand over of all the hats the ladies have made. It is an event I look forward to each and every year. I am always humbled at the warmth and kindness in every stitch in each hat. The messages of hope and love for the children that the ladies include with the hats they have made, are lovingly appreciated by all the children who receive them. We have received over 1,000 hats in the past 3 years along with donations of just over $1,200.00 from Umpqua Bank and their knitting club ladies!! 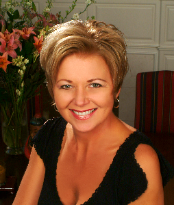 Di Barker is the owner and Principal Designer of Abundanceforlife Living & Interiors and has been practicing Interior Design in Portland, OR since 2001. Di has created functional, elegant and amplified spaces for an amazing array of residential and corporate clients. She received an “Honorable Mention” by the Interior Design Society for the National Interior Designer of the Year Awards in 2011. Before moving to the Northwest in 2000, Di enjoyed the fast pace of Toronto, Canada for two and half years. Born and raised in South Africa, Di enjoyed successful careers as a successful Managing Real Estate Broker, as well as in the glamorous world of fashion and design for 18 years. On behalf of children battling cancer, we thank you, Di, for serving as a Board member and helping Hats Off For Cancer reach more than 1,000,000 children as they fight this disease. We’re so grateful for your involvement! I am a brain tumor survivor and Di’s story definitely resonated with me. I also thought that I had always suffered from migraines, which ceased as soon as my tumor was removed. Hats Off to Cancer sounds like a wonderful organization. Thanks for your post.